The PX751 series has been discontinued. Please contact Sales for possible alternatives. 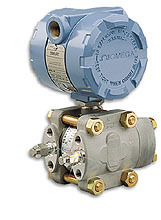 The PX751 is an industrial grade Smart pressure transmitter which offers two way communications using HART protocol. The PX751 features a continuously updated digital output which can provide pressure (in 16 different units of measure), percent of range, analog output and transducer temperature. In addition the HART communications allows remote troubleshooting, reranging and reconfiguration of transmitters in difficult to reach or hazardous locations. The PX751 feature 0.075% full scale accuracy, 0.25% long term stability and a 5 year calibration cycle. Models are available for gage, differential, or absolute pressure measurement. High precision (0.05% accuracy) and high process temperature models are also available.